Mondays are hard. There’s no way to get around it. You wake up late, you’re hair’s a mess, your scooter won’t start, and you have at least 75 voice mails on your phone all from people who want something from you right now. But you can set yourself up for a great week by making a big pot of soup that you can keep going back to night after night. The genius part is that it just keeps getting better and better. I made a huge pot of Chicken Corn Chowder, and I plan to keep dipping in to it for a few days. Step one is to fry up six slices of bacon, so we’re already off to a good start. And it’s all up hill from there. Next we cook some potatoes and green onions in bacon fat. I feel like we could just stop here and be happy, but we’re going to load it up with sweet corn and shredded chicken. Because I’m in Hawaii, I used kalua chicken, which is slow roasted with Hawaiian sea salt. Any leftover chicken or a grocery store rotisserie chicken would also be awesome. When we serve it, we’re going to bring back that bacon, some green onions, and a sprinkling of cheddar cheese. The seasonings are warm, and green chiles and cayenne add a bit of spice. 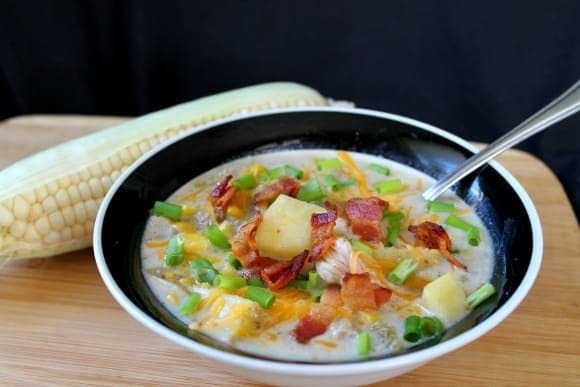 Chicken Corn Chowder is hearty and packed with flavor. Add some crusty bread, and you’ve got yourself a seriously awesome dinner. Mondays are hard, but soup is easy. Get it going, and have an awesome week! 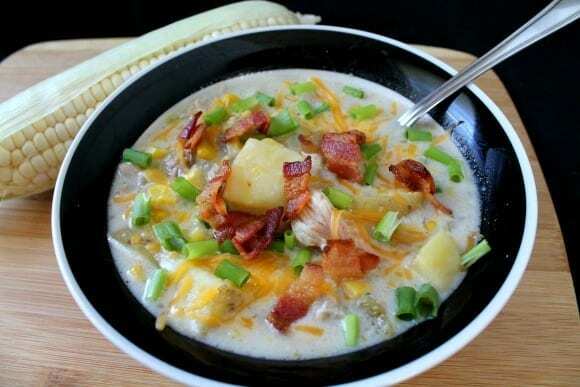 Chicken Corn Chowder gets topped with bacon, green onions, and cheese. It's hearty and flavorful and feeds an army. 2 teaspoons Old Bay or a dash of the following: paprika, mustard powder, nutmeg, cinnamon, all spice, clove, and ginger (Really, any warm spices will work here. Use what you have on hand). In a large pot over medium high heat, cook bacon until crispy. Remove bacon to a paper towel-lined plate. Add potatoes and whites of green onions to bacon fat. Cook, stirring occasionally for a couple of minutes until green onions are softened. Sprinkle the flour into the pan and stir constantly for a minute, coating the potatoes in the flour. Stir in the milk, chicken stock, and all of the seasonings. Bring the liquid to a boil, then reduce the heat and simmer for about 15 minutes or until the potatoes are soft. Stir in the corn, creamed corn, green chiles, and chicken. Taste for seasoning and adjust if necessary. Let this all simmer together for another five minutes or so. Dish up your chowder and top with reserved crispy bacon, the green tops of your green onions, and a sprinkling of sharp cheddar. Refrigerate the leftovers to get your through the week. This soup looks soooo good! 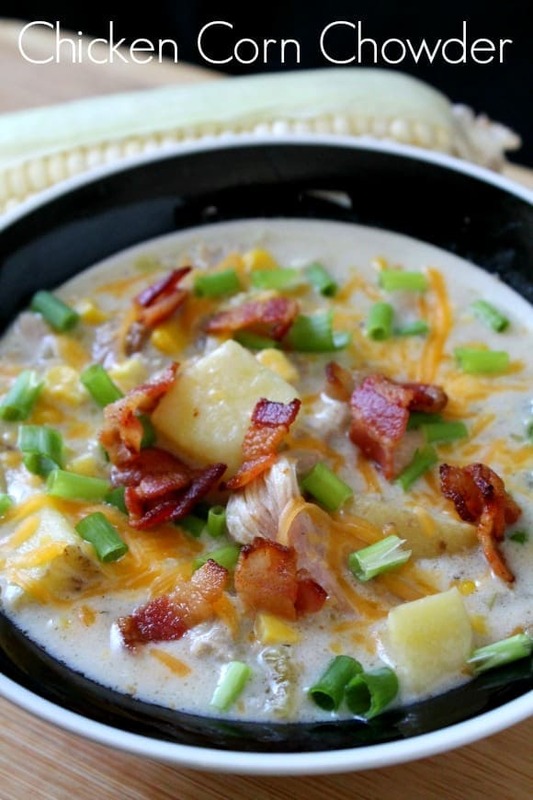 Chicken corn chowder is my favorite, and I am ashamed to say I have never had bacon in it! Definitely pinning this recipe! Thanks for pinning! Bacon is always a winner. I hope you like it. I’m going to try prepping this, and putting it in the slow cooker. It sounds amazing!